I’ve been planning to cook Vitello Tonnato for quite a long time. But it never seemed to be the right moment, or occasion for it. Although the dish apparently looks simple, cooking it is actually time consuming and requires planning. Also, the ingredients are quite difficult to find (and rather expensive). So I really wanted to wait for the perfect occasion: the New Year’s Eve dinner. The main ingredient is veal (vitello in Italian) – a lean cut such as the fillet. I couldn’t find veal, so I used a good quality dry aged beef fillet. Traditionally the meat is rolled into a ballotine and boiled in water (some add carrots, onions and celery to the water, to impair some flavour). The traditional method makes sense, as there was no sous vide technology back in the 18th century, when the dish has been invented. But the problem with this method is that the meat gets cooked completely, it becomes tougher and it changes its colour. On the other hand, if cooked this way, it will be easier to thinly slice it. But I like my beef rare – and I like a bit of technology. So I went for the sous vide route. As for the sauce, there’s plenty of debate going on. It is an Italian dish after all, and it only seems natural that every ‘nonna’ has her own recipe that she swears by. Apparently, in the ‘original’ version, there was only canned tuna, anchovies, capers, a bit of olive oil and a squeeze of lemon. But I have found versions that also included boiled eggs. And I have also found a rather new approach, which used mayonnaise. I went for the mayonnaise, and I have used a shop-bought version. However, if I was to do this dish again, I would take the time and make some home-made mayo, as I felt that the shop-bought one had a too stronger flavour. One more note, before getting to the recipe. Ideally, the dish is plated a day before (all meat covered entirely by sauce), wrapped in cling film and left in the fridge over night. This will allow the flavours to combine, as the meat will take in the flavours of the sauce. Again, I didn’t had the time (nor the patience) to do so. But I should’ve. And I would totally do it next time. 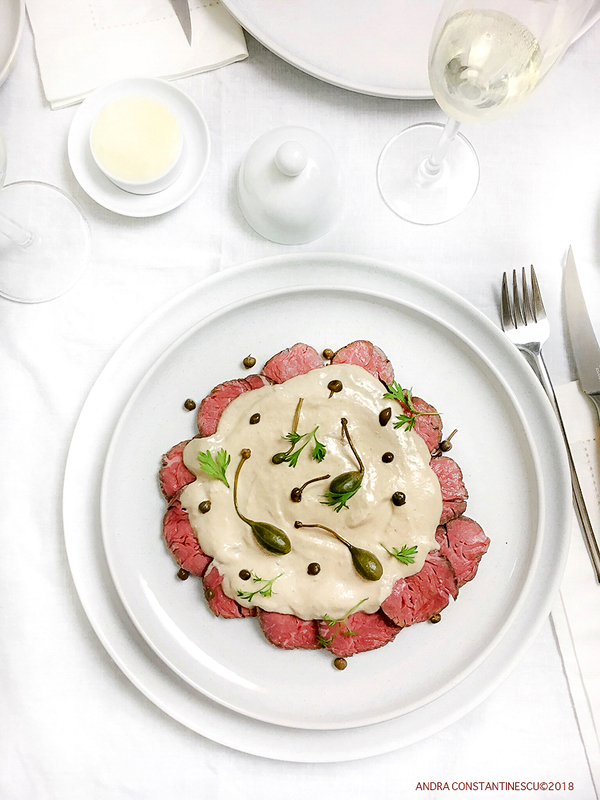 A modern take on the classic Italian recipe for Vitello Tonnato. Make this dish a day in advance and store it in the fridge, covered in cling film, to allow the flavours to fully develop. Prepare the water bath at 56 degrees Celsius. Season the meat, roll it into a ballotine using cling film, then place it in a bag and seal it using a vacuum sealer. Cook the meat for 1 hour. Take it out of the bag and let it cool at room temperature. When cold, unwrap the cling film and sear the meat in a hot pan (30-40 seconds on each side). Allow to rest for 10-15 minutes. Roll it again into a ballotine using cling film. Leave to rest in the fridge for minimum 3 hours. For the sauce, blitz all ingredients using an immersion blender (or a stick blender). To serve, thinly slice the meat and place all slices on a plate. Cover with sauce. Cover with cling film and leave to rest in the fridge over night.